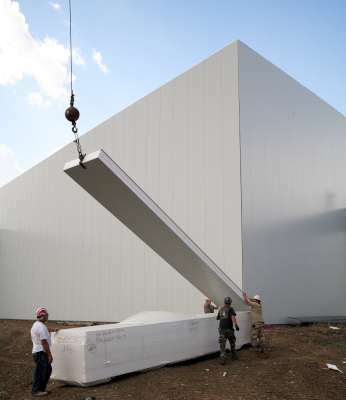 Coolstructures structural insulated metal panels are ideal for warehouses, including commercial cold storage, controlled humidity, or any environmentally controlled storage facilities where energy efficiency or LEEDs construction credits are desirable. 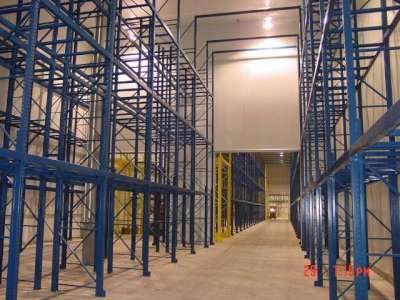 Coolstructures's modular warehouse designs using our Structural Insulated Panels (metal SIPs) provide a proper environment for meat, food, ice, pharmaceuticals, or other goods and materials that require temperature and humidity protection. Refrigerated warehouses and col storage facilities preserve the quality of perishable goods while achieving the energy objectives of green building designs. Coolstructures modular warehouse designs accommodate any variety of dimensions to conveniently and safely store the materials, plus any associated handling equipment, receiving and shipping operations, associated trucking and loading docks, and the needs of the operating personnel. This includes frozen storage, cold rooms, processing plants, and mechanical areas. Coolstructures modular warehouse design concept is centered around its thermally efficient and yet structurally sound panel - - available in a variety of widths, lengths, thicknesses, laminates, colors, and textures. The panels can be pre-assembled before shipping or can be easily slipped into place on the job-site. Our modular construction approach reduces shipping and/or construction costs; plus the strength of Coolstructures structural insulated panels can reduces the extent of the internal steel framework - - further reducing construction costs. And last but not least the excellent thermal efficiencies of the Coolstructures structural insulated panels will reduce operating costs far into the future.